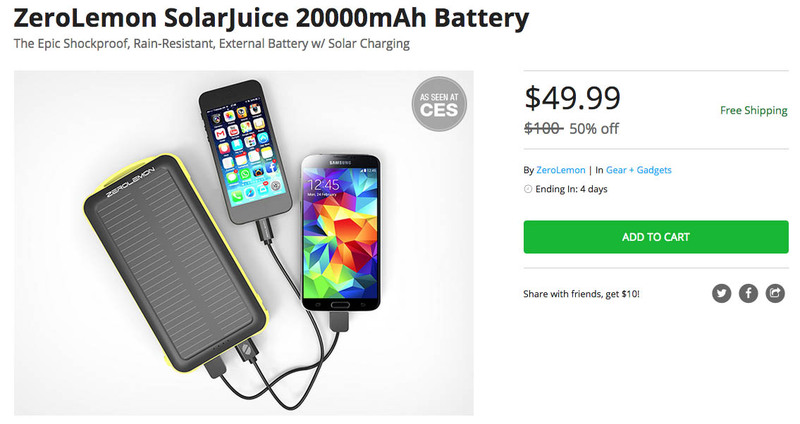 One of the better DL deals we have featured over the past few months has been the ZeroLemon 20,000mAh SolarJuice battery pack because of its massive capacity, but also because it’s durable, can charge two devices at a time, and can re-charge using the damn sun. The sun! To head into the weekend, we thought would share the fact that it’s back and at its $49 price. That’s a pretty solid deal on a battery pack that could charge your phone over and over and over again. As a recap, the ZeroLemon SolarJuice charges through a typical wall outlet or via a powerful 1.2W monocrystalline solar panel. It has dual outputs for charging two devices at a time, is quite compact for a 20,000mAh battery pack, should have a 1,000+ recharge life, and outputs at 2.1 and 1A.